Book co-edited by Rob Rosenthal. Rob Rosenthal, provost, vice-president for academic affairs, and the John E. Andrus professor of sociology, is the co-editor of a new book, together with his son, Sam Rosenthal. The book, Pete Seeger: In His Own Words, is a collection of the legendary folk singer’s private writings—including letters, notes to himself, published articles, rough drafts, stories and poetry—spanning most of the 20th century and into the 21st. 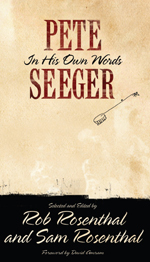 Seeger has never published an autobiography, but these documents provide the most detailed picture available of him as a musician, an activist and a family man. From letters to his mother written as a 13-year-old, desiring his first banjo, to speculations on the future, this book covers the passions and struggles of a lifetime—the pre-WWII labor movement, the Communist Party, the blacklist, the Civil Rights movement, Vietnam War protests, travels around the world, cleaning up the Hudson River and more. The book was published by Paradigm Publishers in June 2012.